Description: This is an annual or perennial that grows to 2 feet. It has finely cut green leaves and orange, yellow, pink, or red flowers that attract both bees and songbirds. Habitat: The California Poppy is native to western North America and is widley cultivated as a garden plant. It prefers sandy soils. Medicinal uses: California Poppy’s antispasmodic, sedative, and analgesic effects make it a valuable herbal medicine. It is used to treat physical and psychological problems in children, as well as pain, insomnia, nervous tension, anxiety and restless leg syndrome. 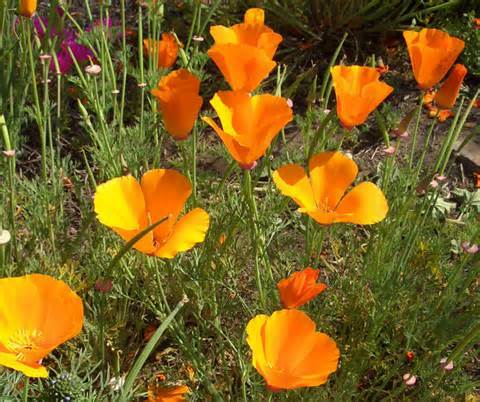 History & Folklore: Some Native American peoples were known to use the sap of the California Poppy as a pain reliever and more specifically for toothaches. Magical & energetic uses: Use the flower, seeds, or essential oil of poppy to help encourage prophetic dreams and enhance inuition. Place a drop of the essential oil on your third eye to promote clear vision while dowsing and keep a vase of fresh poppies in the bedroom to enhance relaxation and sleep.